Move over Agent J! Contrary to what the movie chain may suggest, the real Men in Black are pretty confusing and terrifying. In the fall of 2018, news finally broke out about the latest addition to the Men in Black franchise, and I couldn't be more excited. Men in Black 4 has already reached production and that means that us sci-fi fans will get more of a hilariously fun series. This time around, it doesn't involve Will Smith and his buddy as agents J. and K. Rather. The latest MIB movie will involve new agents, including some new female characters in Sector 6. Most people who study conspiracy theories can tell you that the franchise is based on a real-life reported phenomena. In the MIB franchise, the Men in Black are humans who help protect the Earth from hostile aliens. The real Men in Black seem to be a bit more terrifying. Multitudes of people who have witnessed UFO activity have reported seeing people in black government-style suits visit them and ask questions about what they saw. Most of them also claim to be threatened by them, or to feel like these individuals aren't totally human. These particular cases suggest that Hollywood's MIB might be a lot nicer than the real deal—and that should terrify you. "Barney didn't have a heart, just like you don't have a coin." If there's one thing that real Men in Black are known for, it's striking fear into people's hearts and intimidating paranormal witnesses into silence. Dr. Herbert Hopkins was a person who learned this better than anyone else. Hopkins was working as a consultant for a high profile UFO abduction case when he got a phone call from a mysterious man who claimed to have a wild alien encounter. The man on the phone then asked to visit him, and Hopkins obliged. Within minutes, a Man in Black showed up at his door. The man had very pale skin, strange features, and wore a stereotypical "G-man" suit. Hopkins, struck by the man's strange appearance, didn't have time to tell the MIB to go away. The man pushed himself inside and started interrogating Hopkins about the latest case he was on. Eventually, the man asked Hopkins to pull out a coin from his suit. Hopkins obliged. The Man in Black then asked him about a recent case, the abduction of Barney and Betty Hill, where abductee Barney Hill had died. Hopkins was aware of the death, but wasn't entirely sure as to why Barney died. The strange individual then held up the coin and asked Hopkins to watch it. The coin turned a silvery color, then faded out of existence before his very eyes. The MIB then explained that the coin would "never again be seen on this plane." The Man in Black then suggested that Dr. Hopkins delete all his information on the latest abduction case, seeing as it may not be good for his health to talk about it. "They floated about a foot off the floor." One of the earliest recorded accounts of an experience with real Men in Black happened to a UFO enthusiast called Dr. Alfred Bender. Bender had been poking around the UFO phenomenon in the 1950s when he was visited by a trio of MIB. The first account of Bender's encounter was found in Gray Barker's book, They Knew Too Much About Flying Saucers. In the book, the strange group of individuals were described as emotionless, robotic individuals who demanded that he stop discussing the paranormal. It's uncertain whether or not bender was telling the truth about his encounter. However, many who are close to Dr. Bender regularly claim that he was a very changed, very traumatized man after his encounter with the MIB. The alleged government UFO cover up was so well-known, it was actually documented and investigated by the United States government. The government claims no agents were sent to silence him. "We have everything on file. 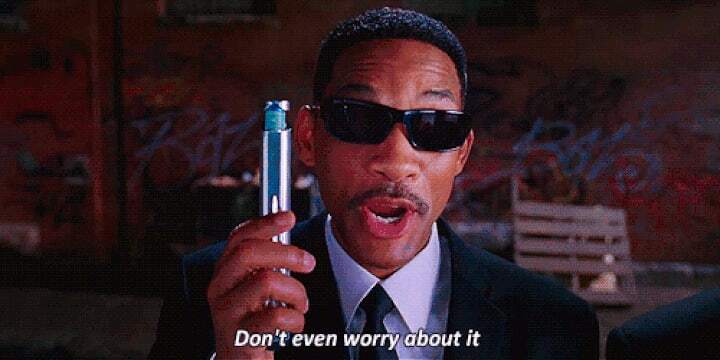 We think you should forget what you saw." Air Force member Paul Miller was out hunting one day when he witnessed a bright disc land in the field where he was. Not too long after, he saw two humanoid beings step out of the disc. Alarmed by the alien encounter, he shot and injured one of them, then ran home. The next day, he went back to work at his Air Force base. Within minutes, the Men in Black approached him and began to question him about what he witnessed the night before—despite him never saying anything to anyone. Miller noted that the men seemed to know far too much about him for it to be a regular government surveillance issue. They also seemed to ask questions knowing how he would answer. After being heavily grilled about the sighting he had, the Men in Black said, "We have everything on file. We think you should forget what you saw." The entire encounter left Miller so terrified, he didn't dare speak of the encounter for years after it happened. It seems like whatever else they said to him was enough to keep him silent for a very, very long time. "The men exuded an uncanny energy which I immediately sensed." Susan Sheppard was a young girl when she and other schoolchildren in her West Virginia town saw a UFO hovering over her house. Though her parents didn't believe the phone calls they received from locals, she knew what she saw. Not too long after her sighting, she became one of the few children to have a chat with real-life Men in Black. As she was playing with other kids in the area, she felt the presence of two men who quickly made herself known. Unlike most MIB, the two men who approached Susan and her friends weren't in suits; they were in black tees and black pants. However, this hasn't stopped them from being quite terrifying to the young girl. "The men exuded an uncanny energy which I immediately sensed. They also looked differently from each other. One man appeared to be of European descent while the other one had an East Asian appearance. The one with the Asian appearance had what looked to be dyed blond hair that was cut very short. Shortly after her encounter, she and her friend began to experience severe migraines that she later linked to the men. For years after the sighting, she experienced poltergeist activity, strange sleepwalking episodes, and a constant feeling of being watched. "I could see they had badges under their coats, but they didn’t identify themselves." One of the more recent stories about real interactions with the Men in Black deals with the recent spate of mysterious booms that have echoed throughout the skies of the United States. More specifically, the series of unexplained booms that happened throughout Pennsylvania. Recent reports suggest that people from the FBI or a similar government entity interrogated locals in the Mullaney area about the booms. More specifically, it seems like the officials wanted to know what people saw—if they saw anything. "He is already in his room." Though a lot of the experiences with real Men in Black seem to have a slightly inhuman vibe to them, some experiences definitely suggest they have at least some sort of human connection. Brad Steiger, who was a very heavily involved UFO researcher, had multiple encounters with unexplained government agents—or people who at least pretended to be MIB. During the early 1970s, Brad noted that there were several bizarre encounters that happened over the phone. It became very clear that someone was watching him and wiretapping his line. When his friend was in a motel waiting for Steiger to come over, he picked up the phone to make a call. He soon overheard to men's voices talking, making very sketchy arrangements that dealt with Steiger's visit. ‘He is already in his room,’ I said in reply, though I knew the query wasn’t asked of me. Goofy? Yes, but one can only imagine how terrifying it must have been. "I had to show him how to use a spoon." Comical as it may be to imagine, many of the real Men in Black seem very poorly educated about how human life works. One of the best examples of this was documented by ufologist John Keel, and occurred to a woman known as Mrs. Butler in Minnesota. Mrs. Butler had recently seen a UFO near her home, and much like other people who see MIB, her visit happened not too long after. This time, the agent was a very strange man dressed in typical MIB garb. He had very unusual features. His hair was too long to be military. His chin was very pointed. His skin had a strange olivine tone and he had no accent to speak of. Stranger still, he drove a grey Mustang rather than a government car. The man introduced himself as Major Richard French, and told her that he was very interested in UFOs. As he asked her questions, he began to appear slightly sick. Mrs. Butler, being a good host, told him to try Jello to settle his stomach. He declined. The next day, things got much stranger. Major French returned the morning after and asked for Jello. Perplexed but polite, Mrs. Butler gave him a bowl of Jello that she made the night before. Now, a normal person would thank her, stop being weird, and leave with the poor woman's bowl of Jello. Rather than be as normal as a random weirdo who goes into peoples' houses demanding Jello can be, Major French just stared at it as if he didn't know what to do with it. After several minutes, he decided to try to drink it—which went about as poorly as you'd expect. Eventually, Mrs. Butler had to teach him how to eat with a spoon. Realizing that she knew something wasn't right, the strange being left, never to be seen again. Later on, researchers found there was a Major Richards who worked near the Air Force. However, he looked nothing like the man who came to Mrs. Butler's door. So, who was he, and what did he want with the Jello? "Was Tiny wearing electric socks? Or was he a wired android operated by remote control?" John Keel took note of multiple encounters that suggest that the MIB phenomenon might involve creatures that aren't actually alive. Many of these experiences suggest that the MIB may be androids or robots created by a highly intelligent alien race. A very unusual encounter happen to the Christiansen family of Wildwood. Shortly after a UFO encounter occurred near the Christiansen family's home, a very strange man from "The Bureau of Missing Heirs" came to interview the family. One of the Christiansens called him the "strangest man I've ever seen." The man was huge, towering at six feet tall and weighing in at 300 pounds. His skin was a sickly white hue, his eyes seemed unusually large, and his government-style black suit was poorly fitting. When he sat down, his pants only reached his calf, which was precisely when the family noticed that he had a large green wire that was coming out of his leg and running down to his sock. It became clear that something was very, very wrong. The moment he spoke, the family was shocked to hear his high pitched, metallic, and monotone voice. He introduced himself as Tiny, and when he spoke, it sounded like his words were memorized and practiced. The Christiansens noticed that he was very sickly looking, so they asked him if he needed something to eat. He declined but asked for "water in 10 minutes." Then, he began to interview them about the family's interests, which clearly had nothing to do with "missing heirs." As he asked them questions, his face became redder and redder. Worried, the family gave him water. He grabbed the water, took a yellow pill, and quickly returned to his pasty pallor. He then left, being picked up by a black Cadillac that drove without its lights on. The next day, a woman called the home to say that the missing heir had been found, and to forget about the UFO incident they saw. So ended one of the most bizarre interactions with real-life Men in Black to date. Believe it or not, there are some records of MIB interactions that do not involve any questions or threats involving UFOs. One such strange encounter involves a strange man in a black suit at Max’s Kansas City, New York. The waitress saw a very sickly looking man with black hair in a bowl cut. He had "long, tapering fingers" and eyes that seemed to bulge out of his head as if he had a thyroid disease. The pale man sat down, and decided to order something. "What will you have?" asked the waitress. "Yes, what kind of food, though?" asked the waitress. It became clear that he didn't know what food was, and for some reason, he couldn't read the menu. Eventually, she offered him a steak, which he accepted. When the food came out, he looked around the room to see how other people were eating. Then, much like Major Richards, it became clear that he didn't know how to use eating utensils. The man struggled with his steak, but managed to eat some. Curiosity got the best of the waitress, who decided to ask where the man was from. He replied, "Another world." "They moved in a weird way. I can’t quite explain it. When they moved it was sort of insect-like." Believe it or not, the United States isn't the only place where real Men in Black have been encountered. A Japanese UFO blogger had a similarly bizarre encounter with a large group of MIB when he was out and about in Tokyo. "They moved in a weird way. I can’t quite explain it. When they moved it was sort of insect-like. Does that make any sense? I can’t really explain why I had that impression, but that’s what their movements reminded me of, insects. It was not strange enough to attract so much suspicion from others I guess, but when they moved and looked about I had that very stubborn impression that it all seemed very insectoid to me." When they sat down in the Tatami room, they ordered drinks that they refused to consume and started fidgeting with a smartphone. It became pretty obvious that they weren't used to using their chopsticks—and that they seemed unusually watchful of him. Eventually, they approached him and asked about his UFO blog, probably to ask if he thought the government is hiding UFOs. Then, they offered to buy him drinks. He wanted to leave, but they tried to get him to stay. "Then they all laughed in a way that, well, it sounded like they were just faking a laugh, like they didn’t even really understand what a laugh was. It also sounded fairly threatening, It all had a very disturbing effect on me. I got the worst feeling from that group." He got up to leave, and they followed despite not having touched their drinks. Somehow, he was able to lose them, but he remains convinced he's still being watched somehow. Somehow, we're pretty sure he would rather have talked to Will Smith's character instead. BREAKING NEWS: Steven Moffat QUITS Doctor Who! Doctor Who, Series 9 Episode 10, 'Face the Raven' saw a heartbreaking exit of Jenna Coleman's character Clara Oswald. Spoilers throughout the Article!